A few months ago, lain illustrations by yoshitoshi ABe was released in Japan. Essentially, it's a repackaging of "an omnipresence in wired" with a few new images. You can order the book from Akadot retail. (Other online sellers might have the book for less. You might want to shop around). We are currently in development of adding an exclusive section to the english adaption of Yoshitoshi ABe lain illustrations: "ab# rebuild an omnipresence in wired"! The thing is, we wanted to try something new and exciting by getting some additional input from the anime and manga fan community! "Serial Experiments - Lain" has been a cult classic amongst Japanese and American fans alike. This remixed and reissued edition of Yoshitoshi ABe's illustration book is a another example that "good anime never goes bad". "I was talking this idea over with ABe-san and his Japanese publishers..." says DMP Director of Operations Isaac S. Lew. " and I really wanted to hit a core connection with not the just the fans, but the industry as well... Before FLCL or Boogie Pop Phantom, there was the creepy excitement of Lain. 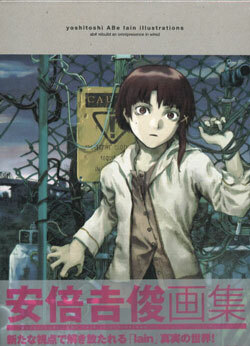 I want people to remember how significant "Serial Experiments - Lain" series was to the North American anime growth. " This will be DMP first attempt at releasing a full color art book in 2006. Support from the fans is a must! Just go to DMP's forum page and join the "Yoshitoshi ABe & Lain's Wired" section for more details. There is also the possibility of getting mention in the published book. Aka-san says that DMP has 8 pages to "do whatever we want". I had a chance to look through the forums and see what people had come up with. The DMP staff came up with the idea of having illustrations of Lain in different outfits/costumes. I think that would be fun, but would these be ABe illustrations or fan-created illustrations? I think that having new Lain art by ABe himself would be the number one thing to add to the American version of the book, but fanart might be a good second option. As some of you may remember, Ray DiPasquale and I (in conjunction with TechTV) ran a lain fanart contest a few years back where we asked people to present their own visions of Lain. If DMP is looking for good fan artists, I can get in touch with the people who submitted to our contest. I think the most important thing is that the content needs to be truly new. 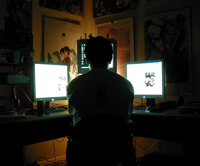 For six years now, my own site, thought experiments lain, has been offering interpretations of the anime, explaining references (Apple computer references, for example), looking into all kinds of miscellaneous stuff (such as lain merchandise), and (most importantly, perhaps) providing links to third party resources so people can learn more on their own. Plus, there are plenty of other lain sites and discussion venues out there that a lot of us have visited/participated in. As such, I'm not sure if more of the same is really necessary in the new ABe book. In the announcement, Isaac Lew brought up lain's impact on both American anime fandom and the American anime industry. I think that's a really good starting point. An essay about the anime's historical significance, featuring interviews with anime fans and members of the industry, would be pretty interesting (to me, at least). It's something I'd happily contribute to. Anyhow, I'm curious what you think. Feel free to comment here if you want or on the relevant DMP forums. Well, I'd like to know what ABe-sama would do differently with Lain today. It's been a while, and it's sort of an icon. However, creators often have second thoughts about what they've left behind. I'd also like to know if ABe-sama has any intentions of revisiting the story, or if he's considered using it as the starting point for a "spiritual" revision. I'm think here of what was done recently with "Futakoi" becoming "Futakoi: Alternative." And while I'm at it, the reverence towards Lain (at least, perhaps, in America) makes it ripe for a parody...a moe version or a chibi version. I would love to see another series developed from the humorous panels ABe-sama did with Lain and her sister. Finally, without intending to be rude, I think it would be terribly enlightening to anime viewers everywhere if ABe-sama could share with us the financial secrets of the SEL project. Was the production economical because the principals worked so tirelessly on it, and what were the financial results like? How well have the books and character goods done? Here's another idea: A visual tour of ABe's studio, or his favorite hangout spots. I too would love to see an essay or two on the historical impact of the series. I am not sure why, but I have always loved to read things like that. I also like seawebs idea of putting some financial info into the book. Im always interested in how well my favorit series sell. One thing I think would be fun to see is for Abe-sama to include some of the most interesting and/or outlandish interpretations of the series that he has heard/read. I think that this could be really funny and should not lack in subject material since the very nature of the series encourages the viewer to interpret it in their own way. Update: Aka-san at DMP posted new details regarding the upcoming book release. He wrote: "We will be having an exclusive step by step section of how some parts of the lain images are created." Lain Limited Edition: Hardcover+ Plus Cardboard slip (Same as Japanese edition), Plus extra cover art poster. 39.95"
source: Aka-san's post on the DMP forums. just found your blog. lain has been my favorite series for sometime now (as well as ABe being my favorite artist) and your site has always provided a really great collection of info and interpretation. so, thanks for that. i just bought the japanese version of the book, actually. i purchased it from j-list (http://www.jbox.com/PRODUCT/PB830). i received it today and came to TEL to see if it was listed, as i had not heard of it/seen it before. i like your suggestion for a tour of ABe's workspace and favorite locations. i agree too w/ the suggestion of asking ABe what he might do differently were lain made today. what i would like is, perhaps, some discussion w/ ABe about his feelings on the relatability of various characters in the series--what makes people relate to the series the way they do..if that makes sense. i suppose more of an emotional take on the series. unless i'm the only one that relates? i don't think i am, right? anyhow, keep up the good work lawmune. Thanks for writing, lovelain. I'm glad you have enjoyed the site. Unfortunately, if you look at Aka-san's post that I linked to in a comment above, it looks like they aren't taking suggestions anymore (they didn't use most of the suggestions anyway). Answering your question, I am also one who relates to the series (and its characters) emotionally. glad to know others relate to lain (and company) as well. i didn't notice until after i had posted my comment that the post was some months old. Looking back and moving forward. The things I learned while working for Opera. A different perspective on Japan's "Otaku Boom"
The opinions expressed in this blog are my own and do not necessarily reflect the opinions of my employer or anyone else.